Strawberries are in season! 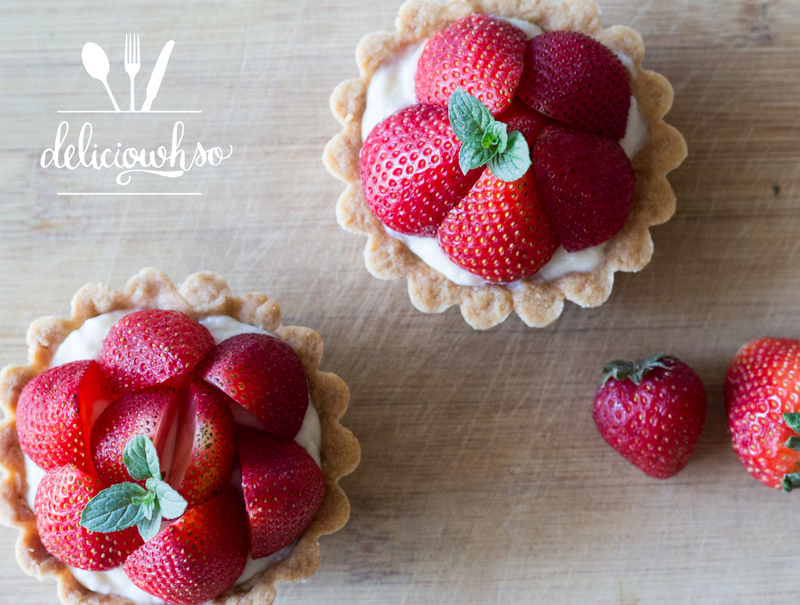 Summertime is just about here, bringing the sweetest strawberries! Speaking of sweet- happy mother's day! I have been blessed with the sweetest mothers :) One of the memories I have is with my stepmom making fruit pizza- it's basically a bigger version of a fruit tart. I guess you can call the fruit pizza a bit of an inspiration for this post. 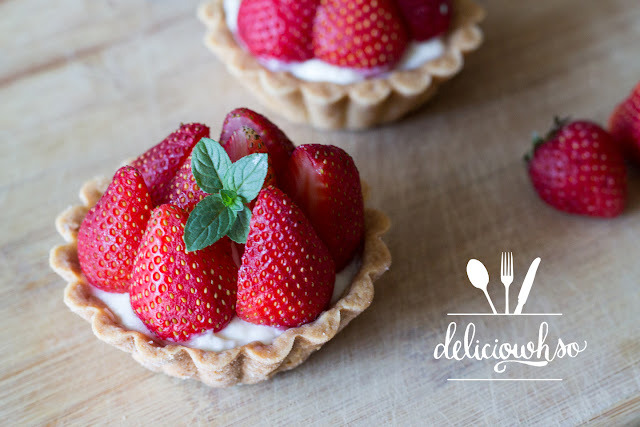 Fruit tarts are one of my favorite desserts, and I couldn't help but use the beautiful, ripe strawberries. The champagne cream filling is a perfect compliment, offering a creaminess with slight kick. 1. In a bowl, cream softened butter with sugar until light and fluffy. 2. Add the egg yolk and incorporate well. 3. Add the flour and a pinch of salt and mix until combined. 4. Pour your dough out onto a plastic wrap and allow to rest in the fridge until firm. 5. Once firm, roll out until about 1/4 inch thick. 6. Line greased tart shell with the dough, trimming the edges. Repeat if you have multiple mini shells. Poke holes with a fork to vent. 7. Preheat oven to 325 degrees F. Bake the shell until golden. Remove from the oven and cool completely. 1. Put 3/4 cup of milk into a pot with the butter. 2. Add half the sugar to the milk in the pot, and the other half into a bowl with the remaining milk. 3. Add yolks and corn starch to the bowl with the 1/4 cup of milk. Whisk to make into a slurry and combine well. 4. Heat the milk in the pot until it is scalding. Pour slowly into the bowl, while whisking. Pour the mixture back into the pot. 5. Whisk the mixture on low heat until it thickens. The mixture will boil, and the starchy flavor will cook out. 6. Immediately pour the mixture into a bowl. 7. Mix water and gelatin together. Melt in a microwave with champagne. 8. Add the gelatin mix to the pastry cream. Mix until combined. 9. In a separate bowl, whip heavy cream and confectioner's sugar to soft peaks. 10. Fold the heavy cream into the pastry cream into incorporated. 11. 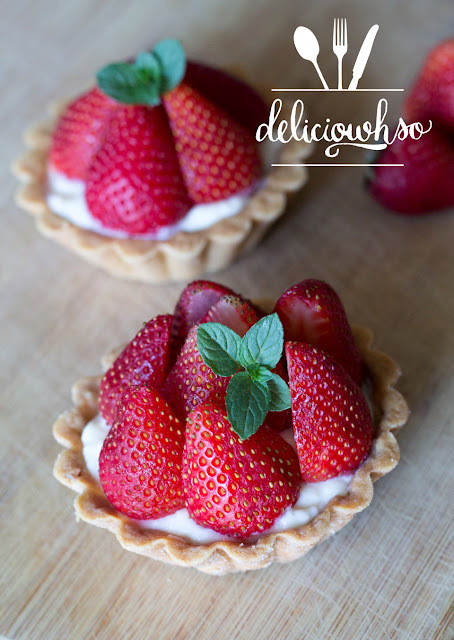 Pipe the cream into the cooled tart shells, and top with strawberries.